That's the ugliest moose I've ever seen. Several years ago I was driving down a county (spelled dirt) road with a high fence on one side, like to lost control when a giraffe walked out of the trees, then began to see ostrich, antelope, strange looking deer, etc. Seems a liquor store owner in Houston (must sell a lot of booze) had an exotic game ranch of several thousand acres. Makes a foresters day to see stuff like that, also makes you look around for the lions and tigers and bears, oh my. I had a similar experience in Florida, TR. Saw a giraffe, then a zebra along the interstate. Discovered that this is a 4 year old male named Ollie. 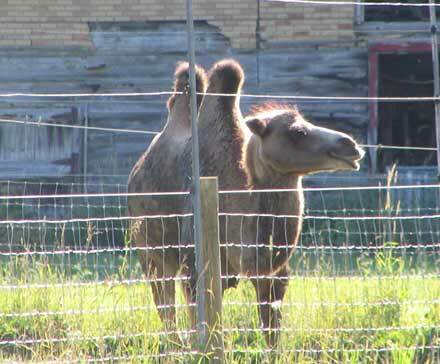 He's a Bactrian camel native to the steppes of the Himilayas and used to winter conditions. 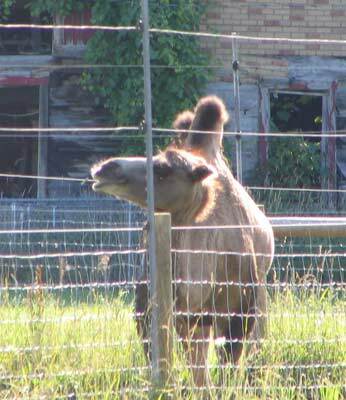 The single hump variety is a dromedary. I'm waiting for them to find BIGFOOT up here them I'll post pics. I'm still looking for the eastern cougar. Sprucebunny, does this qualify as something unusual? 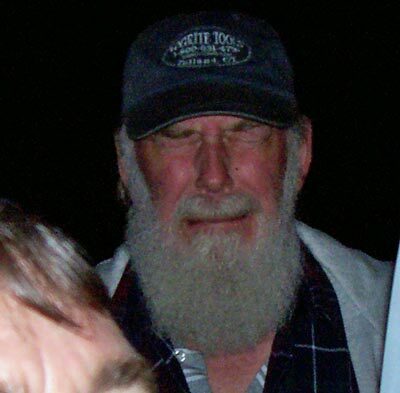 I was getting ready to get in my truck one night and a heard something sneaking around in da dark so I aimed the camera over my shoulder and got this shot. Does anybody know what it could be? It's got a Logrite hat on, but no eyeballs. Here's the blowup also. Just ask any ol' farmer down around here. Any one of 'em will swear that they've seen a Florida panther at some point in their lives. I'd be less surprised to find bigfoot in my backyard than a cougar. Well, I'm convinced I saw a Panther crossing the road under I-295 one morning back in the middle eighties and had one raise the hair on the back of my neck one night here at the house in the late eighties. I guess big foot is next. DanG!!! Such a critter, woodbowl, would keep me outta the woods at night. My Neighbor up north, Lou, informed me last trip up that we indeed do have what several folks have been seeing up there. He saw it for himself walking across his very remote driveway. He said it walked slowly across the drive and leaped easily over the 10 foot wide ditch followed by its long tail. I should have never told Tammy, as now she is fearful of me being out in the woods alone there. I simply told her that its been there all along and she wasn't afraid for me up until then. I'm hoping eventually one of us will catch the cougar on a trail cam. Panther ...............raise the hair on the back of my neck one night here at the house in the late eighties. Now that is getting close. How did he raise the hair, lick it or blow on it.? OK. If I must tell the story. I had just moved onto my property. There were no neighbors. I was in a dilapidated single-wide trailer that I had purchased as a repo and moved out here to hold me over until I could build a house. All alone, it was Pitch black. There was no wind and, as I recall, the moon and stars must have been covered by clouds. I had just laid my head on my pillow and let out a sigh of relief that the day was over when the swamp and the trailer was filled with the loudest scream of a horrified woman that I've ever heard in my life. It was coming from the swamp behind the house and must have been very close. Someone was being killed right here on my property. I jumped out of bed and ran to the front door where I hardly touched the steps, and ran around the right side of the trailer where I had cut a trail into the woods a few weeks earlier. Down this path I hurried as I tried to get my wits back and peer through the dark. Then, as if the heavens opened and the light of a thousand angels appeared in my mind, I was struck with the realization that I was standing in the middle of Thomas Swamp in bare feet and my skivvies. Quickly I reversed my direction and began a high stepping two step back toward the trailer, or, as best as I could discern, the general direction. It was a "whistling in the graveyard" moment. I had taken no more than ten steps when the scream was emitted again. This time my back was to it, but, I could almost feel the heat. It was a cat... a big cat... What in the H.. am I doing out here? I dug my toes into the dirt and high-tailed it to the trailer, rounding the corner as my feet threw twigs, acorns and dirt across the yard. One leap to the steps and I was inside, slamming the door and trying not to shake too bad. I went and sat on the edge of the bed, but sleep was impossible. Finally, I made a pot of coffee and sat in the kitchen drinking it, wishing that I had some kind of shutters I could put on the windows. By early morning, I was satisfied that I could sleep and again went to bed where I slept until my alarm went off at 5 am. I cleaned myself up, shaved and got dressed in my three piece suit, gingerly walking across the front yard (a bushhogged area of maybe 500 square feet) and was relieved to find that I had gotten inside of the car unscathed. I made the long drive to work, about an hour, and could hardly wait to tell my story at the Directors meeting. Nobody would believe me. It had to have been a Panther but, as I was told by these intelligent businessmen, There are no Panthers here. I've never had this happen since. But, I'll tell you that I can still hear the scream in my mind. It was as if someone were using a megaphone about 3 feet behind my head and yelling at the top of their lungs. Have I been into the swamp in my skivvies since. Yes. I guess I'm a slow learner. I ended up back there one night amongst a herd of deer and had the lead doe blow on me. I ran that night too. I would still, out of curiosity do it again. I wouldn't run anymore though. Now I can't. If I can't keep my composure long enough to get back to the house, I guess I'll just die right there. I heard a similar scream with my dad when I was about 12 years old. We were surveying our land up in Delta County in the U.P. I'd hold one end of the 100 yard tape while my dad would force his way through the brush on the surveying line. Late in the afternoon, I heard what sounded just like Tom described: a woman screaming bloody murder. I've never been more scared in my life, and I think I ran that 100 yard dash towards my dad so fast that Carl Lewis would have been left in the dust! We think it had to have been a lynx, though maybe it was a cougar. We know there are lynx in the Stonington Peninsula, and just not sure if anyone's claimed yet that the cougar is there. Regardless, that's the most terrified I've been in my life. I did see a cougar cross the highway on I-196, near Benton Harbor. My then girlfriend was in the car with me, and if she hadn't been there to confirm what I saw, I don't think I would have believed myself. September 16, 2000.....Sitting in my breakfast room, looking out at the field behind the house, as dusk was just about to begin, I saw what I thought at first was a very large dog. It was walking along the deer trail and as I watched it I couldn't help thinking it couldn't be a dog because I've never seen a dog move the way this critter was moving. I grabbed my binoculars and raised them up...looked...lowered the binoculars...raised them again...and couldn't believe my eyes. It was a cougar. A big cougar. I remember being surprised at how much silver color it had. I called a friend that works at the State Police Barracks, and they were very interested that I'd seen the cougar. They asked me to call the Game Commission and report the finding. They told me that I might be given a hard time, but to please do it anyway. So, I called the Game Commission. The gentleman informed me that I hadn't seen a cougar. I said, "Yes, I did." He said, "Lady, you did not see a cougar." I said, "Ok, then I'd like to report a cat the size of a German Sheperd in my backyard." Roxie, maybe thats what Lou saw. A pine squirrel the size of a German Shepard. I was checking my cows today when this creature came out of the woods. I am not sure, but I think it is a baby dinosaur. Tales of the Wierd -- What strange things have you found when working with wood? Page created in 1.23 seconds with 40 queries.